We have another delicious white chocolate recipe for you from www.berryworld.com. 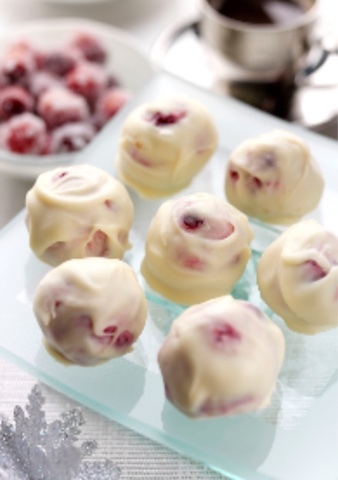 Not only does it include lovely white chocolate, this delicious truffle recipe also features fresh BerryWorld cranberries - yum! Smooth and delectable, the combination of sharp cranberries, creamy white chocolate and zesty orange make these a wonderful taste sensation as well as a perfect Christmas gift or after dinner treat. Place the cranberries, Cointreau and orange zest into a small pan, bring to a simmer and cook until softened and syrupy. Leave to cool. Chop or break 300g of the chocolate into small pieces and put into a heatproof bowl. Place the cream and butter into a small saucepan, heat until just about to boil, pour over the chocolate and stir until melted. if the chocolate doesn’t melt with the heat of the cream, place over a saucepan of simmering water for a few minutes and stir until the chocolate has melted. Stir in the cranberries and leave to cool, then place in the fridge for 4 hours or overnight.With a small spoon or melon baller scoop spoonfuls of the mix and roll into balls, then pop into the freezer for approximately 30 minutes. Melt the remaining chocolate in a bowl over simmering water. Place each ball on a fork and dip into the melted chocolate, swirling around until coated, place on a sheet of baking parchment, leave to set in the fridge. These delicious truffles are best served straight from the fridge. Cooks Tip: These lovely truffles make an ideal Christmas gift, place in little paper cases and then in a small gift box wrapped in ribbon, store in the fridge and eat within a week. For more information about BerryWorld's delicious berries visit www.berryworld.com. There are also a lot more recipes on their website.